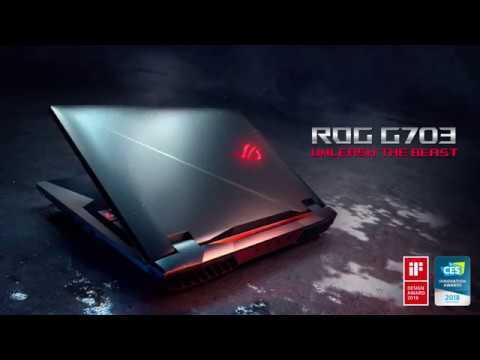 ROG G703 is a beast of a gaming laptop that has the power to take on today’s gaming desktops, thanks to its 8th Generation Intel® Core™ i7 processor and overclockable NVIDIA® GeForce® GTX 1080 graphics. G703 is the key that unlocks supreme levels of gaming, so you can play AAA games on Ultra graphics settings without compromises. 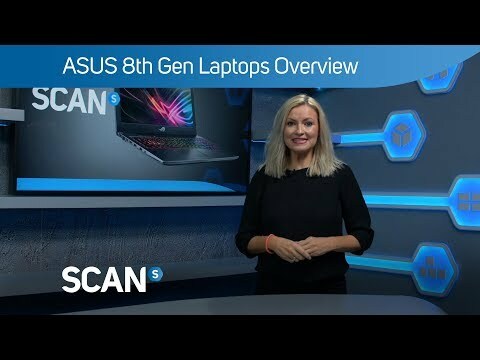 Continually pushing the envelope, ROG has torn up the gaming laptop blueprint, becoming the first to integrate an ultra-responsive IPS-level 144Hz display with a 3ms response time into its laptops. G703 features HyperDrive Extreme storage, which uses exclusive technology to combine upto three NVMe PCI Express® (PCIe®) SSDs in RAID 0 configuration for read speeds of up to 8700MB/s, so games load up in a blink of an eye. *2x NVMe PCIe 3.0 x4 SSDs included only. Simply saying that G703 has gaming desktop levels of performance would be an understatement. It’s powered by a 6-Core Intel Core i7-8750H that’s capable of hitting an incredible 4.1GHz – blazing through single & multithreaded tasks alike. While its high performance NVIDIA GeForce GTX 1080 GPU and 8GB of GDDR5X VRAM are simple to overclock to achieve maximum performance, and can easily reach speeds of up to 1974MHz and 10.3GHz respectively! This graphics prowess lets you enjoy the latest AAA titles at their maxed-out settings for immersive gaming experiences. The ROG-exclusive Gaming Center puts all this performance at your fingertips, with an intuitive dashboard that lets you push G703 to its limits with a mouse click. The newest NVIDIA GeForce 10-Series graphics architecture offers the highest possible gaming laptop performance, new gaming technologies, and unmatched VR experiences. The NVIDIA GeForce GTX 1080 GPU used in G703 features 2560 NVIDIA® CUDA™ cores and can easily boost its clock speed up to a maximum of 1974MHz. GeForce GTX 10-Series also supports Microsoft® DirectX® 12, enabling the newest visual effects and rendering techniques for gaming experiences that are more realistic than ever before! Benefit from improved speed and lower power consumption with 32GB of DDR4 2666MHz dual-channel RAM (upto 64GB total supported). With an 11% performance boost over 2400MHz RAM, get ready to take your gaming experience to new heights. With a refresh rate of 144Hz, fast-moving visuals are no match for ROG G703. Take in all the minute details and enjoy super smooth gameplay, even at the highest graphics settings. This lets you react instantly to what’s happening onscreen – giving you an advantage in action, first-person shooters, racing, real-time strategy and sports titles. NVIDIA G-SYNC™ technology synchronizes the display’s refresh rate with the GPU’s frame rate to make gameplay silky smooth. G-SYNC minimizes stuttering, reduces input lag, and eliminates visual tearing all without affecting system performance. You get the smoothest, fastest, and most immersive experience across a broad range of games. Exclusive Aura RGB lighting technology allows you to customize light effects right down to individual keys. You can even create unique colour patterns for each game to help you find and master its controls. The keyboard used in G703 features N-key rollover and anti-ghosting technologies, and a highlighted WASD key group to provide precise control; while a 2.5mm travel distance, a 0.3mm keycap curve, and a durable anti-slip palm rest ensure you stay comfortable. In addition, unique hotkeys allow instant access to Xbox Game bar, ROG Aura, Gaming Center, and XSplit Gamecaster. • Per-Key Lighting Aura RGB. Aura Sync technology gives you the freedom to customize and sync up light effects with Aura Sync-supported gaming mice, headsets, and other peripherals to give your entire gaming setup a consistent look and feel. With a full spectrum of colours to choose from, as well as eight different lighting modes that can be accessed via the Aura control panel, Aura Sync technology lets you express your gaming persona, or the feel of the game you’re currently playing. While the dynamic fans automatically adjust their speed according to CPU and GPU temperatures, you also have the option to select the OverBoost, default Auto, or Silent modes to suit the situation at hand. A single press of the function key allows you to quickly and easily regulate fan performance to control noise levels and power consumption. Fan OverBoost is the most aggressive setting, providing the fastest fan speed for the cooling required to fully exploit the power of G703. Silent mode lowers the fan speed, ideal when you’re after some peace and quiet. • ESS 32-Bit Hi-Fi DAC. • Incredible 384kHz Sample Rate. • Sonic Studio III 7.1-Channel Surround-Sound Signal. • Powerful Quad-Speaker Sound System. • Smart Amp 200% Louder Volume. Sonic Studio III is a useful suite of tools to support all of your in-game audio needs. A control panel gives you access to five different audio modes, and even lets you manually adjust settings. This software suite includes noise cancelation, voice-volume stabilization, and echo cancelation during recording. Even when you’re using earphones, it’s able to simulate a 7.1-channel surround sound signal to create an immersive gaming experience. The immersive Sonic Radar III audio engine processes sounds more accurately than ever, so you’re always aware of what’s going on around you. Use the on-screen arrow to hone your enemy-pinpointing skills, and enjoy visualized audio detail that eliminates the need to crank up the volume — the perfect tool for practice rounds and tuning untrained ears. Aura RGB lets you customize the colours of the keyboard right down to each individual key. Take control and choose from ten lighting presets, including Breathing, Colour Cycle or Rainbow modes. Create individual key colours for every game to master its controls, and customize the ROG logo to match your mood or style. You can even activate Aura Sync via Aura RGB as well. A lifetime subscription to XSplit Gamecaster Standard lets you live stream and broadcast directly to internet streaming platforms, or make recordings for easy sharing online. It allows you to make in-game annotations to highlight what’s happening on screen. You can even interact with your audience while broadcasting on Twitch. ROG GameVisual software provides six preset modes for different game genres, plus loads of exciting multimedia and customization settings. ROG software engineers have fine-tuned each setting to deliver exceptional visuals that perfectly complement each specific game genre. First Person Shooter (FPS) mode, for example, enhances visibility in dark environments — so you’ll see details denied to your enemies, for a clearer shot with every pull of the trigger. ROG GameFirst V technology maximizes throughput for your game! It prioritizes network packets for increased bandwidth for online gaming and streaming. Auto mode prioritizes all of your applications based on a choice of four preset scenarios; while Manual mode lets you categorize programs and prioritize them accordingly. In addition, ROG First ensures ROG routers and ASUS RT-series routers prioritize packets according to the GameFirst V settings in your ROG laptop. Keep ROG Gaming Center close at hand with the Android or iOS app on your smartphone or tablet, so you can access it without interrupting your game. What’s more, they’re free to download from Google Play™ and the App Store. Features • High Performance Gaming Laptop. • GeForce GTX 1080 Graphics with 8GB GDDR5X Memory. • 144Hz 17.3” Anti-Glare IPS-Level Full HD Display with NVIDIA G-SYNC, & 100% sRGB coverage. • 32GB of 2666MHz DDR4 Memory, expandable up to a total of 64GB. • 2x Ultra-Fast 256GB M.2 PCIe NVMe SSDs in RAID 0 (for 512GB Total), Combined with a Massive 1TB Seagate FireCuda Solid State Hybrid Drive. • Aura Sync Per Key RGB Backlit Chiclet Gaming Keyboard. Integrated Xbox Wireless Module for Xbox One Controllers. • Features USB 3.1 Gen2 Type-A & Type-C Ports, along with HDMI 2.0 & Mini DisplayPort 1.3. • Windows 10 Professional 64-bit Operating System.